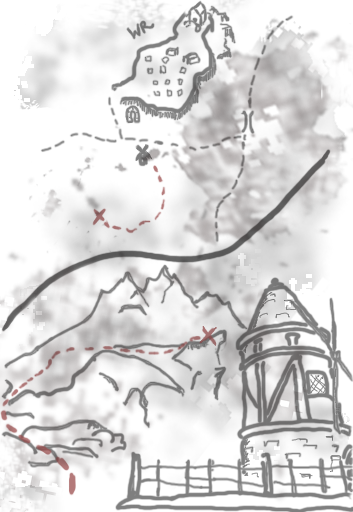 A treasure map to a hidden cache near Pelagia Farm (map). Start by facing the entrance to the windmill on Pelagia Farm. Move south, and start bearing to the right (west) slightly. As you go up the mountain keep turning to the west, you will be funneled into a path. The treasure chest is under some bushes at the top of a rise on this path, not far above the snowline. A horse at full gallop takes approximately 50 seconds to get from the windmill to the treasure. The chest may not be there at all. The chest can be spawned to the hidden spot by using the console command "f4a03".placeatme 10e05e.